You have for some month been dreaming about to travel to a spot of your dream. You have even started to look at some relevant dates, and even started to make planes for stay there longer than a normal holiday. Yes, you want to move your skills to a new level. 1. To much work at the office right now! 2. I don’t think I have enough money for it! There are for sure a lot of other challenges to make a windsurfing trip or surf trip to come true, but the work and money part is maybe often the main challenges. Then, here you have a sort of a guide to deal with it. 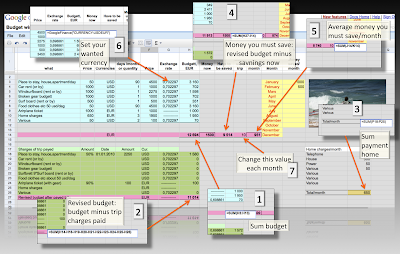 To take care of the money part you have further down a free download spreadsheet template for xl or google doc. Challenge 1: To much work right now! Yes, you have probable to much work or some another important appointment that tie you up to stay home. This is no excuse. The way to deal with this is to very early prepare all your surroundings, your work friends and others that you are going for a long holyday from a specific date. If you do this in a year in front you have good opportunities to make it come true. You should set up a realistic tie schedule suitable for your work and for your economy and just go for it. If you prepare yourself, your work, your boss, your friends and others for it in a really early stage you have a good chance. The problem here is if you don’t really go for the dates in an early stage, suddenly there come some important meetings an important wedding or something else. If the trip not is totally clear it is already in danger to become cancelled. Challenge 2: Not enough money! There are in fact two situations here that’s true, ok, you don’t have enough money for it. But there is also a situation that you don’t know in detail exactly what the trip will cost you. So the complexity of this may lead to a cancelation of the trip. The guide here is for sure a matter of course, just save money for it, but it is also meant as a motivation for you. If you here as well start a year or so in front of your trip and think about it everyday you have a good chance. You should really look at your economy of where you can spend less money. Do I really need a new mobile phone, is it possible to change to a cheaper mobile subscription, do you really need the subscripting on that magazine, do you really need new clothes and so on. If much of your expenses is on food, you could now have a motivation of by smart. It is in many way boring to think like this, but the motivation factor here is strong, and a few money here and there get much after a year. The next thing is to have a good overview of the costs of your trip. You should think about everything. Staying, airplane ticket, car, board, broken gear, food, gas, and so on. If you have planes for period of unpaid leave from your work you should even set up for cost back home. If you want to, you can for free download a template of this spreadsheet. I recommend you to use google documents spreadsheet, because you then have access to it where ever you are and you also have the nice detail that the currency is updated automatically. The currency part is a nice thing if you are travelling form a country with another foreign currency. But if you like a Microsoft xl document better you can download that as well. But if you use the Microsoft document you have to change the currency by your selves. To open the spreadsheet in google doc you need to have a google account and user of google documents. If you not are a user it is free to sign in. Here in the picture below some explanations of the details in the document. The currency in the template is set to euro “EUR” You can change the currency to what ever you want to. But you have to remember to do this in all the document. Just double click on the currency area, and change it. As an example if your travel goes to Australia change USD to AUD. Tips: Change the picture in the document to a pix of your selves as an extra motivator! As said the guide here is for sure a matter of course, but I hope someone find it useful as a motivator to make a dream of a windsurf trip, surf trip, or maybe a bike trip snowboard trip, ski trip or something other kind of trip come true.